Wow! You must have good eyesight to see a baby like that, the only time I see babies is when they are on the side of the tank (as they are usually clear) and using a magnifying glass. Fingers crossed it survives. That's quite a setup you have rigged up for the hatchery, I hope it pays off. The easiest way to keep the tanks cool (as long as they aren't in direct light) will be to run the air con permanently as I had a quick look and even at night your forecast is 26+, we are lucky if we get that a few days a year during the daytime, hence we don't have air con generally over here. It is much easier than buying some coolers/chillers and setting them up (I don't know how you do that) but probably more expensive long term! At least with the air con on you can just pretty much not even bother to check the temperature, apart from occasionally. Good to hear that the tetras are recovering. I watched a 4 part youtube of 'marks aquatics' on how to breed neon tetras - I think I will stick to just buying them as they are really cheap over here anyway. Hope you get their tank sorted ready to start cycling today. With my ac switched on the main tank of crystals and the yellow tanks are now reading 21°c. The crystals suddenly became so active grazing more and doing flips, yeah i guess they really love cool temps. It was a good thing i was working directly under the tank light else i would have missed the shrimp entirely, it was colourless and so tiny. Wasnt moving much, guess it just hatched. A cooler fits between a canister filter and the return tube to the tank, the cooler has a in and out to connect the canister tube. If they are already free swimming, and you don't have fish in the tank, you can remove it from the hatchery, my babies are with the rest of the shrimps and it's mother. I never give it food, it should be able to find food. @kms yep i read about the chillers but you know since i have in the same room, 2 shrimp tanks and one tetra tank on going setup, i thought it would be more cost efficient to just turn on the ac. Furthermore, the chiller looks to be too complicated and bulky to my liking, if there should be some maintainence like heavy lifting to he repair store, i dont think i can manage. A plus point my 2 dogs love to be in the room now with me when i do tank maintainence because of the cool temps. You can get cooler, cheap and very small, but does run up a electric bill. I admit I would put the air con on, all for the easiest solution, plus you ALL benefit people/dogs/tanks etc. The only down side would be higher electricity bills but if you aren't worried then leaving air con on seems the easiest and most rewarding for all route. Otherwise you have to run 3 chillers for the 3 tanks? If you're not worried about the increased electricity of running the air con, that is the route I would go definitely. Thats a wrap for tonight! Relaeased 2 out of the hatchery, the other 2 just did not want to peave so i stuff some moss in there so they can at least hang on to something. This is very encouraging to me, seeing that they hatch. Was so sad that mummy died and honestly, i didnt think i could pull this whole thing off, i really did not think someone as brainless as me could see live babies hatch from these eggs. Here are some photos of the moment, sorry for all the typo errors in the previous reply, was too emotional. I could really celebrate. You know, its one thing to have so many shrimp dying and one other life changing thing to witness eggs that you saved, actually hatch! I understand, I was like that when I saw my first baby. GREAT news, well impressed and pleased it worked out! I will keep my fingers crossed they survive. You should rightly feel pleased with yourself, and hopefully it has boosted your confidence so you can carry on with renewed vigour! JOJO you definitely should watch this video, and not just because it is the same shrimp as you have. It is a bit long and he is a bit of a waffler but it mentions A LOT of what has happened with you so it may explain somethings better than I could, ie the water change may have caused your berried shrimp problem etc. Ok i will watch it in abit and let you know what i think! Yep i have watched that video. Mark is really passionate about the hobby, you can hear it in the way he talks about things. Much like yourself and jayc. Thanks for sharing this video, it is indeed very relative and actually it did encourage me a whole lot. I learnt alot from this video. I think i myself killed yellow mummy shrimp, not the water parameters, i did it. Realized i should not have done that 800mls water change after they were in there. There wasn't a need to do that water change actually. They had just acclimatized to the tank not too long ago and i should have left them to it. I had the idea that i wanted the water to be pristine and so a small 800mls water change isnt going to be shocking anyone. I failed to remember that they had just came into this tank from the breeders. So had i not done the water change, they would not die. I think the drip acclimating done for them in the bag was done well but i shocked them further, another time you could say, when i did that water change way too soon. 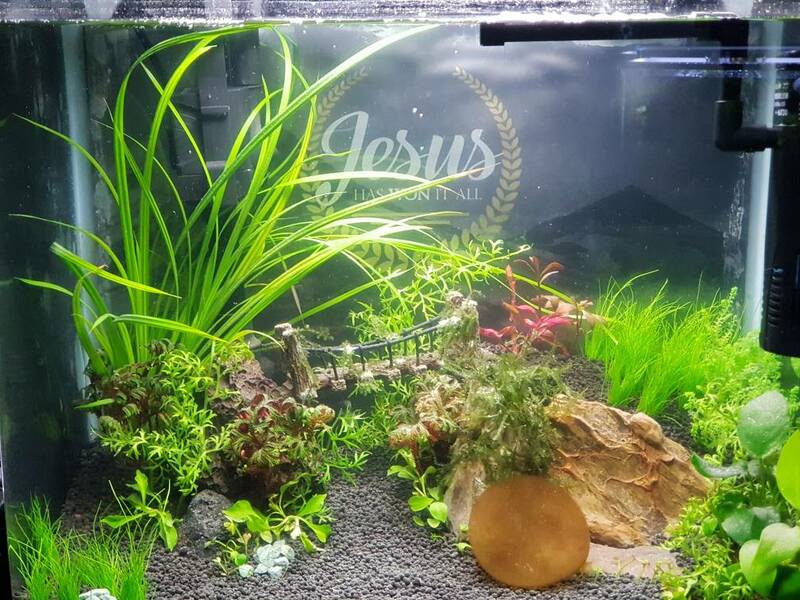 Kills me to remember that actually that water change was not really needed. (Believed nitrates was low, tds was just about climbing but not rocket high). Could be why after that, they dropped like flies and than the one baby shrimp from the pail died along as well. Makes me think, i actually neglect the shrimps diet generally. In the sense i do not feed them regular enough. Had thought they can eat all that biofilm in the tank, i only drop a minute sized pellet or powdered shirakura chi ebi in for them once a week or sometimes even once every 2 weeks, i wonder if this could be why they seem to be dying from molt failures despite the water being relatively better than last time? Noticed that they die usually with a gap after their heads and always after a water change. Because the water is really better than before when i first started and i slow drip back new water into the tank but it is so frustrating to see 1 die day after a water change. I may have neglected their diet in this aspect??? Will give a try to use fresh boiled foods for a change to see if things improve, want them to have more vitality for sure. Im sure if i neglect this area it would affect breeding for sure, i had been too obessed with getting the water better till i neglected nutrition. Lastly he talked about keeping everything to a constant and in a way he is saying dont chase numbers, see what works for you in your setup and that takes trial and error. Will definately keep that in mind now that i am better than when i first started. I think this video was really meant for me, thank you again simon. It was a bit freaky that so much was relevant to you, it had the same shrimp, and it was only posted yesterday, freaky, it was posted for you! He also mentioned that shrimps can die a week after they are put into a tank due to the earlier stress. Also he mentioned feeding the new borns so hope you saw that? You have quite a small tank with quite a few shrimps in it (the yellows) so I doubt the tank would produce enough food on it's own to cover them all. If you use broccoli or spinach make sure it is organic (no pesticides or pollution). I feed mine something every day and alternate, but with commercial shrimp food I use the 'dip a pin into the tank 2mm, then quickly into the food, then back into the tank'. I would do this same thing with yours every other day, dipping 1-2mm of the pin into the tank quickly. Each step has to be done quickly so that not too much food/powder sticks together. Regarding the water change, it is probably a bit impossible to not do a water change when a female is berried as there is likely always going to be at least one berried? I do a weekly maintenance in 28L where I change 2L (about 7%) but it slowly drips in over a period of 6 hours (I timed it yesterday for reference). As you say, it probably was a mistake to do a water change so soon after putting the shrimps in the tank as it wasn't needed really but like ALL of us you learn by these things so don't be too hard on yourself! Although I never had ANY problems when I started with cherry shrimp as I think mine were supershrimps (I didn't even acclimatise them in any way, just chucked them in with the fish straight from the shop - I didn't know any better at that stage so it was sheer dumb luck they survived I guess), but you are still doing really well in such a short time, certainly way better than when I tried the TB the first time! I think the main thing, BOTH videos said was to keep everything constant and stable. It is better to mess about with the parameters BEFORE you put the shrimps in the tank, but sometimes this isn't possible! Glad you were inspired by the youtube video - it could have been made specially for you, spooky. Yes this is for me, the video. Was it really made recently? Well than, i will just take it as if he was giving me a lesson. Liked that he gives advice based on what works and not what brings in viewership. Yep going by that and how you feed your shrimps, i think my shrimps they could eat a little more. Actually like a few minute pin portions of food every other day is fine. Guess i have been reading too much on planaria and all the other horrific overfeeding nasties. Yep i also noted on the feeding of the newborns. Will go get some betaglucan by glasgarten probably on sunday. I see that they strip the biofilm real fast like what you mentioned, its probably because my tank is so tiny. Hopefully this product is good for the babies as he mentioned they need some bacteria in their guts. Anyways, both my tanks are reading 20 to 21°c as of yesterday till current. They all seem more cheery and lively. Well back to the drawing board i guess. Working on my tetra tank till late since its the weekend. More babies have arrived this morning! I think that video was only posted 3rd January so the very day you had problems, spooky! I use the Bacter ae (bacteria) and the Beta Glucen (immune system) but as the original video I use a LOT less than they recommend and use it twice a week. Again I use the pin method so as not to get too much, the bacter ae clouds the water if you use too much. I go by 'a little is better than none, but too much is dangerous'. Hope you got the tetra tank set up and now you can just wait for that to cycle. Fantastic to hear you have more babies, hopefully everything will be on the up from now on, you have passed the first week as well. I have put spinach in my tank this morning and counted 97 shrimp, got to start culling again? Congrats on the new babies. I count 4 of them now. When you run out, try rolled Oats. You can put the oats into a blender if you want it a smaller size. That's essentially what that product is made of. Oats, Wheat, Barley blended into a powder. Update: i released all the babies in the hatchery today. Counted 14 babies plus another 2 that was released earlier. Could not see much of the babies so i do not know if they will all survive. Sad that i cant save all the eggs. Had high expectations and hopes. Anyways, i managed to finish the setup for the tetras and tank is cycling at last. Another great looking tank, hope the tetras appreciate it when it is cycled! You are using the same filters as I am, don't forget you can remove the base so there is more exposed sponge area, and it makes cleaning the sponge easier as you don't need to pull the body apart, just pull it out from the bottom etc, you don't even need to remove it from the tank side, just rotate it 120 degrees! You did well to save even some of the eggs to shrimplets. I wouldn't expect you to see them for a while in the tank as they hide a lot for the first few weeks or more. As when I transferred to the new tank there were loads of newborns I didn't even know were in the old tank????? I finally bit the bullet and started culling again, did 10 juveniles, tank still looks over-run though! Got to do the shrimp tank weekly maintenance today. Will have a look at the video you shared, as with all the videos so far, it definately was of good help! Hopefully you are right about the babies, maybe more will pop out when they get bigger, just off hand, i can only see 2 babies at any one point. Noted about that filter! I added that filter that was originally from the main tank of crystals and fire reds. This new tetra tank came with an overhead filter, as i am still new to this hobby, i ran it last night and saw that the flow wasnt great, its very gentle?? (never operated an overhead filter before) So that was the reason i added in the internal filter. I like the water column to have more circulation. You know what else? Ever since i ran my ac 24hrs in the dry mode and kept my room to a constant 23°c, i noticed that the 3 remaining crystals are not dying and seem to be more alive? I see why now everyone is saying they need those low temps, have read over the weekend somewhere that this is due to their thicker shells, they have thicker shells compared to neos. Well, on the whole, i can see improved vitality in all the shrimps, neos and caridinas now that the temperature is lower and is stable. Hopefully i see some berried females this year, thats hoping i actually have some males in the tank. I hardly ever see any newborns bit have about 100 juveniles? I think the mother shrimps release the shrimplets somewhere out of sight (makes sense) and they don't then move far from there until they are about 20% full size. Really pleased to hear that everything is looking up and going better! Are you planning to keep shrimp in with the tetras, if you weren't planning on that you could just put any culls in there and they will be ok with the fish, make that tank more interesting and solve the cull problem of setting up a tank for them, or killing them? I wasnt actually intending to keep the shrimps with the tetras. The main tank with lots of fire red babies will need looking into soon, they have grown and i can see they come in a myriad of colours. I could swear i put 12 of them in there, treated them with paraguard, now they are fabulous but when i count them, i can only see 9 of them??? I dont see dead bodies as well during my weekly maintainance of this tank. Wonder where the 3 of them went. 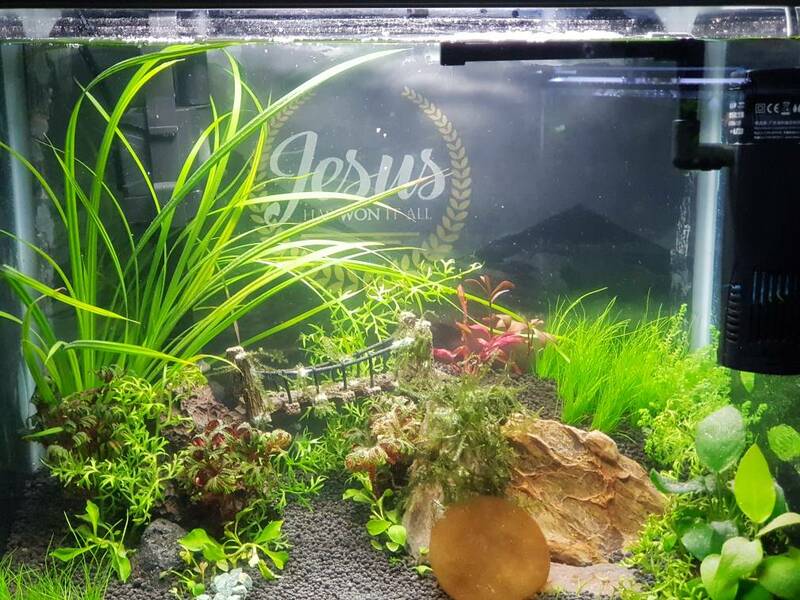 By putting the 'ugly' shrimp in the tetra tank you won't be culling as such as they will be fine and still living a good life and still be helping keep the tank clean etc? The tetras MAY eat some tiny babies, but they have a chance they won't get eaten and they probably won't be a bright colour so can hide much better anyway. Is there a cover on the temporary tetra tank as they may have leapt out. When I moved the piece of furniture my fish tank is on many years ago, I found a couple of dried neons! As you have a dog of coarse it may have eaten any evidence of any leapers??? My current tank has a cover so its not a problem. If you are keeping them in a dark uncovered bucket especially I would expect they would leap out?